With a VMware® Ready certified Thecus NAS, business users can utilize their NAS together with VMware® servers to build virtual infrastructure and create virtual machines (VMs). On virtual machines, different operating systems can be set up and numerous applications can be installed on each OS so as to carry out various tasks. 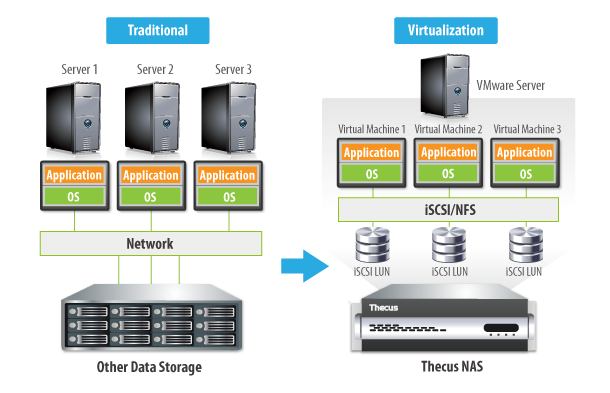 A Thecus NAS with a VMware® server will form a unified pool of resources that can be used by VMs to run applications. Compared with traditional single servers with single sets of applications models, virtual infrastructures significantly reduce operating costs, lower electricity consumption, and increase overall hardware resource utilization. Users of popular virtualization hypervisor, ESXI, can now appreciate full support for VAAI. vSphere storage APIs for Array Integration allows storage operations in the virtualization platform to be offloaded to networked storage, improving overall performance of the Virtualized Desktop Infrastructure (VDI). Citrix® XenServer™ is the only enterprise-class, cloud-proven server virtualization platform that delivers critical features such as live migration and centralized multi-server management at no cost. Thecus Citrix Ready NAS have all passed the Citrix verification process. Designed for line-of-business and mission-critical applications, the Certified for Windows Server 2008 R2 logo demonstrates that Thecus enterprise solution meets Microsoft's highest technical bar for stability, security, reliability, availability, Windows fundamentals, and platform compatibility. 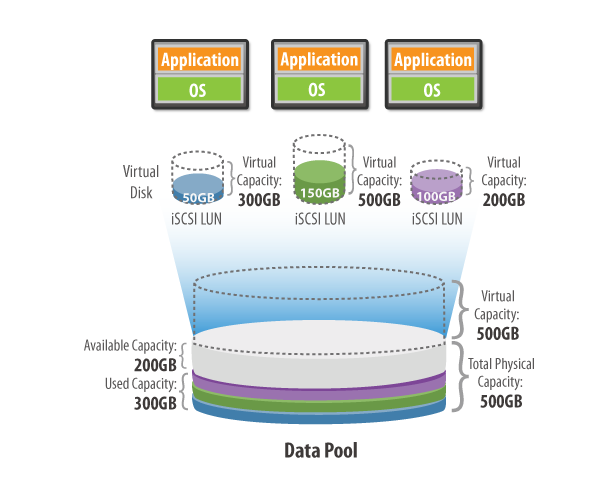 iSCSI Thin Provisioning allows administrators to create up to 5 iSCSI Thin-Provision targets under one iSCSI Thin-Provision volume. These iSCSI targets will then share physical storage space from the iSCSI Thin-Provision volume. iSCSI Thin-Provisioning prevents administrators from over-provisioning physical storage space before it is actually needed, thus greatly reducing capital spending on storage for businesses of all scales.